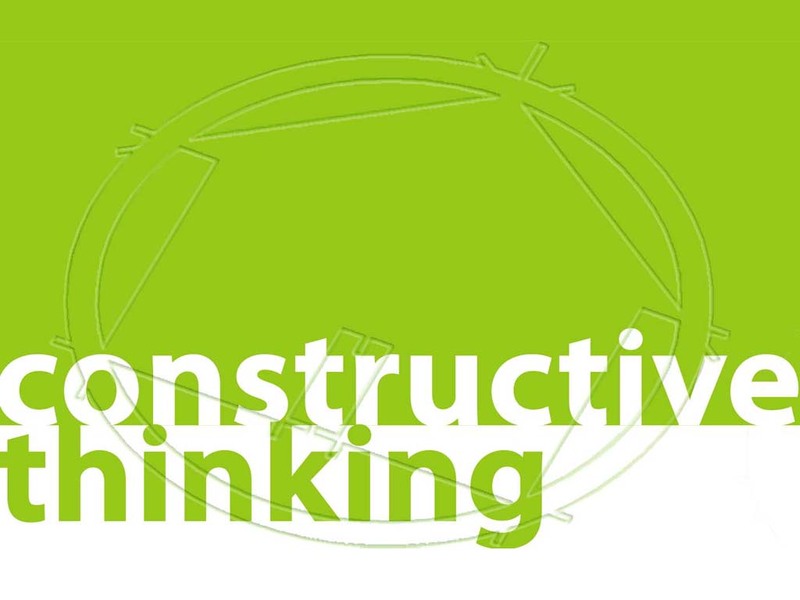 Constructive Thinking (Architects) became involveed in formulating proposals for the Welsh Streets via a number of different circumstances and projects we have been involved in over the last five years. First of all, we have just completed the renovation of two large terraced houses on Botanic Rd in Kensington under the TSB retrofit for the future programme. 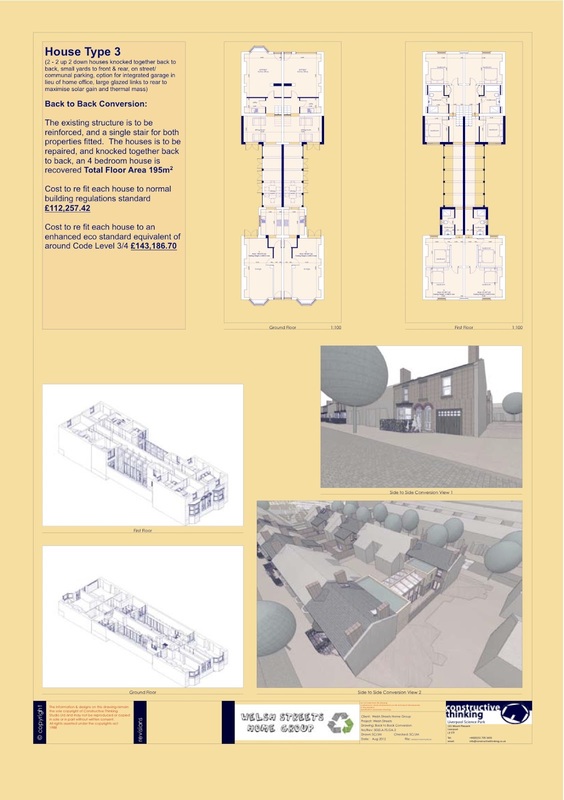 The details for this programme can be found online, but the interesting parallel with this project is that we renovated one of the houses to current UK building regulations standard, and the other to an enhanced eco specification. 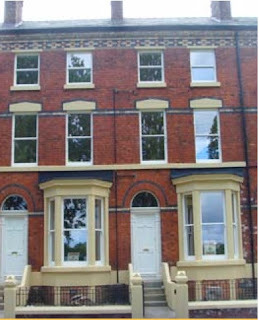 Both of these renovations were from a bare brick situation similar to those on this site, and were brought up to a housing association lettable standard. So far as was practicable, all of the suppliers, contractors and tradesmen were based in Liverpool or the North West. Secondly, over the last few years, we have run university design programmes (undergraduate) in both design and research based around the regeneration of this part of the city. Not all of them have involved retention, and not all of them have involved wholesale demolition, but over the years, with our students we have explored a number of different options , and from this have a deep understanding of the area along with the challenges and aspirations of the stakeholders involved. Finally we have been living and working in the Liverpool area for over 20 years, and in that time have gained a wide understanding of the culture of the city and its inhabitants. As such our aim was that this in conjunction with our engagement with the community during the design process would allow any proposals or ideas to feel very much of the city. 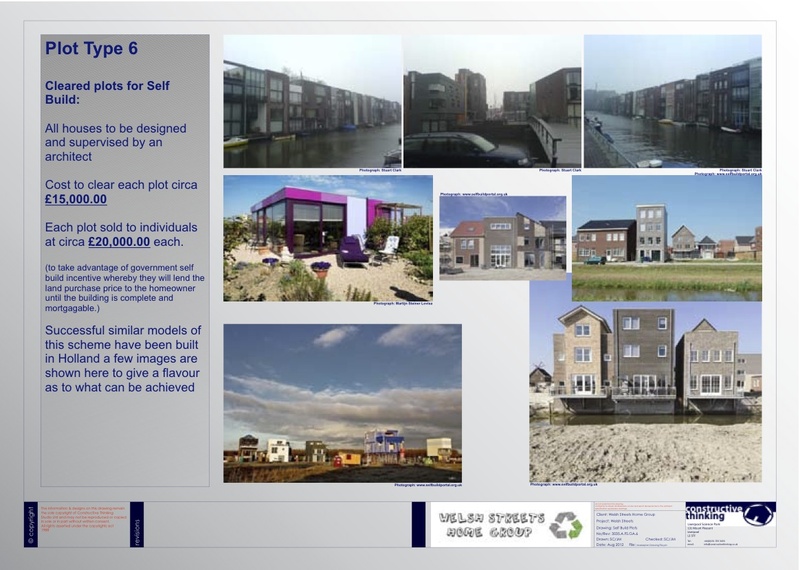 There have been a number of different proposals for the Welsh Streets (by others), most of them have ‘engaged’ with the public to a greater or lesser extent, but none of the designers seem to have been given the opportunity to look at retention and refurbishment in any meaningful way. There also appears to have been only a cursory nod to the provision of community amenities. The very real threat from demolition has eroded trust and engendered fear within the community. We were asked to take a look at the viability of retention, and remodeling where possible, and to proposed some kind of amenity which could contribute to the integration of any new residents into the already established community. 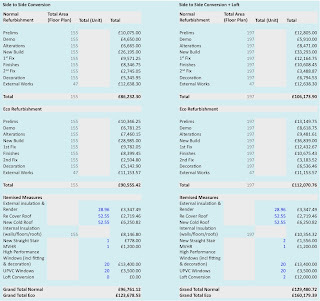 We were also asked to give some options for developer-led new build within our proposals so as a direct cost comparison could be made. We were to focus on the four streets from Kelvin Grove to Powis Street. Principles set out within this study may be readily applied to a wider site. It's really important to us. So important that we've set up a few surveys for you to complete. • Remove the tarmac finish from the roads to expose the existing cobbled surface, and repair where necessary, this would have a couple of benefits. First of all they are a great traffic calming measure, as they’re uneven, and it makes a lot of noise if you drive over them too quickly; they are also far more attractive than tarmac. • Selective demolition to form new pedestrian & cycle route through the site in order to give the site a more inward focus, away from the traffic on High Park Street and South Street. • The currently vacant site on the corner of High Park Street, Kelvin Grove and Wynnstay Street is, at the moment used by local children for playing games. Our proposal takes this use and formalises it by providing a semi-enclosed sports pitch. Its proximity to the main road is however an issue so we have proposed a combination of fencing and planting not only to soften the edges of the site, but also to discourage users running straight out into the road following any stray balls. • Selective demolition in the areas adjacent to High Park Street to provide secure off street parking for some of the roads. This would allow for the front yards to be reinstated and potentially planted up giving a greater sense of privacy to the reisdents, whilst at the same time making the street more attractive to look at. 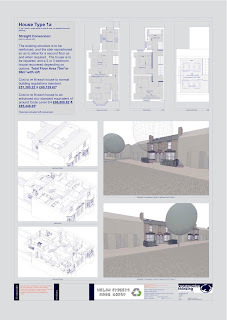 • Following on from the successful historical examples of Abercrombie and Faulkner Squares in town, we felt that the existing, vacant area to the South Street end of Voelas Street could work in a similar way. 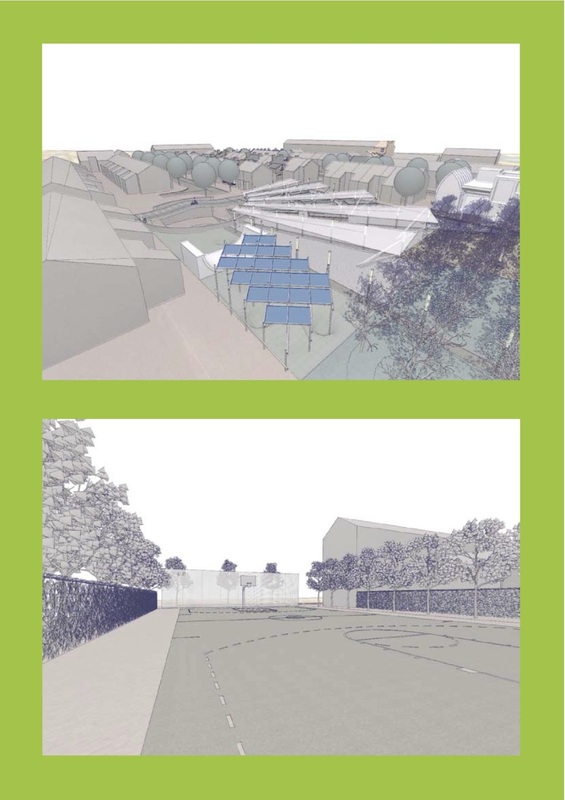 We proposed that this part of the site be put to use as a community garden to allow for the lower level of amenity space available in the retained housing stock. The area would be enclosed with new build on Wynnstay and Rhiwlas Street, and to South Street by an orchard (more on these later) . 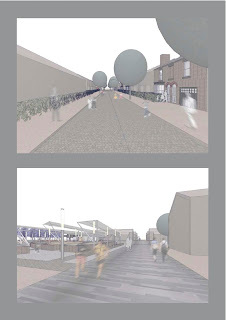 The encolsed area would then be landscaped to provide amenities for the community. 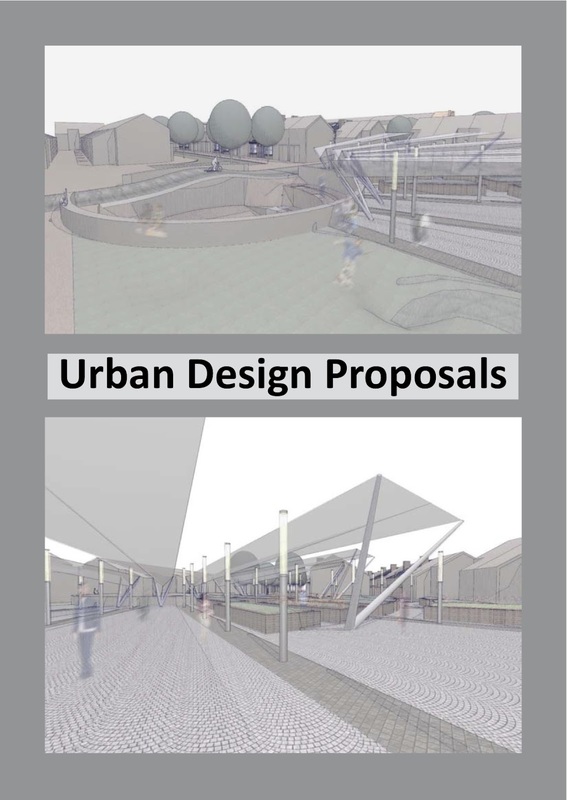 The following were proposed: composting facilities; community growing beds (formed from bricks reclaimed through demolition); skate & bmx park; childrens playground; covered outdoor space for events such as farmers markets; performance area/bandstand; and a community PV array. The idea with these amenities would be that they are provided and maintained by the residents themselves, allowing them to take ownership of them, engendering pride in the locality. 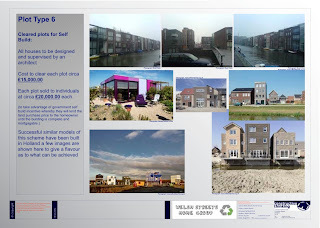 • The new build mentioned above would be in the form of plots to be sold off to self builders. The demand for this type of development appears to be on the rise, and it has recently been encouraged by central government through a few schemes set out in the last budget. This should add a much greater sense of variety to the area and allow for an even greater mix of tenure. • Currently there is a problem with drainage and flooding along South Street after particularly heavy or long periods of rain. We have been informed that this stems from the burial of a stream on the site some years ago. 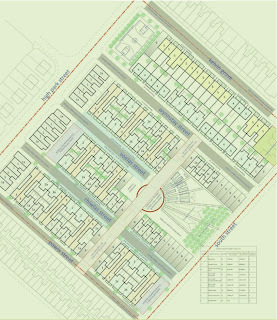 Our proposal to negate this is to use permeable paving across the site, with a new open attenuation tank (indicated as a circle on the plan) this would collect rainwater at peak times and run off/eveporate once the rain had stopped. Additionally this could be drained off and cleaned down in the summer to provide a sunken performance area similar to a bandstand in a park. • Along high park street there are a couple of remaining retail units at the moment surrounded by vacant ones of similar size. Our proposal here is once more a mixture of amenity and market solutions. First of all, at ground floor level the first option is to modernise the retail units and put them back to the market, however we would also propose that a number could serve as amenity for live/work units above. For example, it has for some time been the aim of planning policy to encourage cycling, however provision of secure storage is often not sufficient to do this on its own. We would therefore propose that as an amenity to the office/ studio space at first floor, we would convert 1-2 of the units into secure indoor cycle storage, with associated shower and changing facilities. • Finally to the orchard mentioned above. There is currently a potential issue with land contamination on the site along South Street due to one of its former uses being a tannery. This gives rise to problems with the topsoil as a growing medium, particularly in terms of its use for growing food. Given the sheer number of restaurants in the city centre, all of which have food waste to dispose of daily, we suggested that some of this waste could be collected and composted on site for use as a new growing medium not only for the orchard but for the raised planting beds as well. Once again in an attempt to show as many different opportunities as possible for the site, our third proposal aims to increase the opportunity for new build to a far greater extent than before. 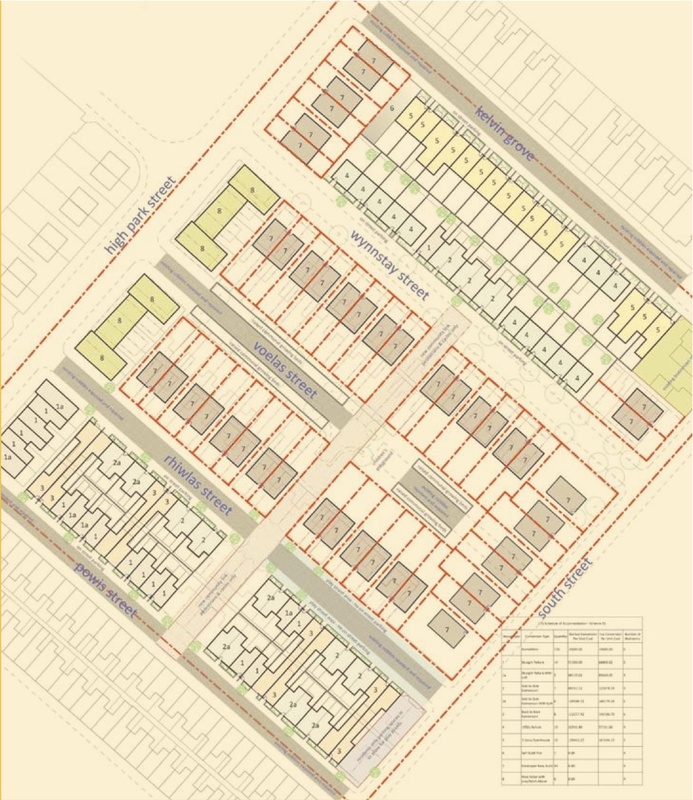 Whilst this proposal still retains some of the elements from the first one, it pretty much proposed the wholesale demolition of all the existing houses between Rhiwlas and Wynnstay Streets. 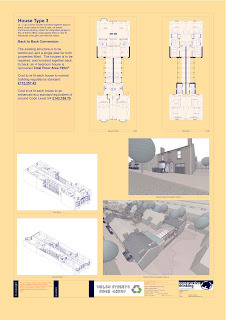 In this instance we have retained the street layouts to minimise the infrastructure costs, and used Voelas Street as the basis for a linear community garden between the proposed semi detached properties indicated on the drawings. Following on from the all singing all dancing scheme above, we realised that whilst the proposals were for the most part feasible, they were also quite a radical departure from most of what had been previously proposed. 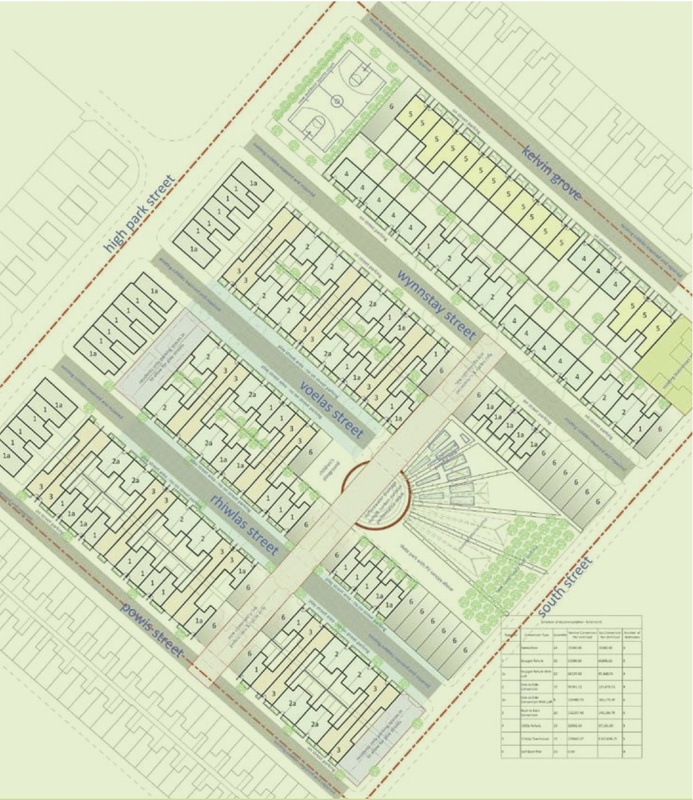 We therefore considered it desirable to come up with another slightly more restrained version bringing in some elements of developer new build and leaving out some of the more contentious parts of the proposals. 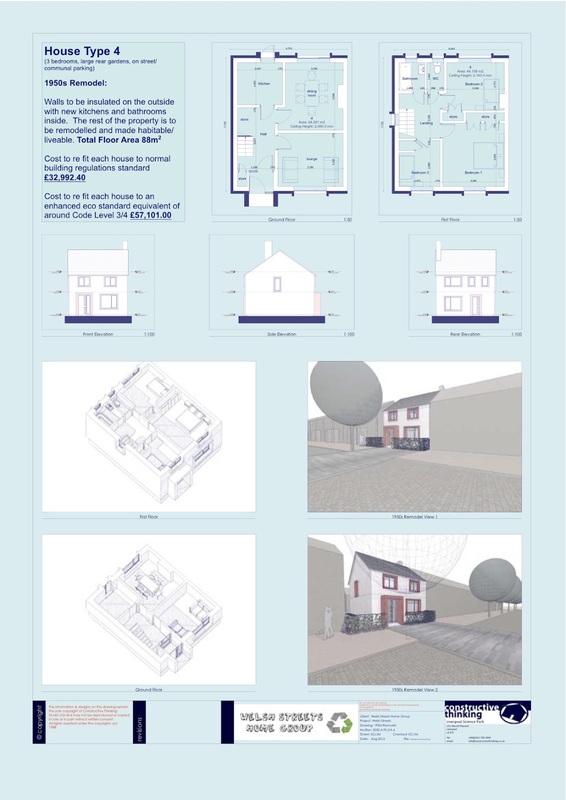 As you can see, a lot of the main elements of the design have been retained, to this we have added a small but significant amount of new build to the site, as well as increasing the amount and variety of the plots available for new build. 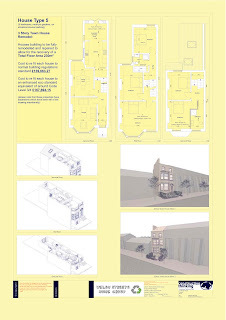 Along High Park Street we have also allowed for new build retail with live/ work units above. 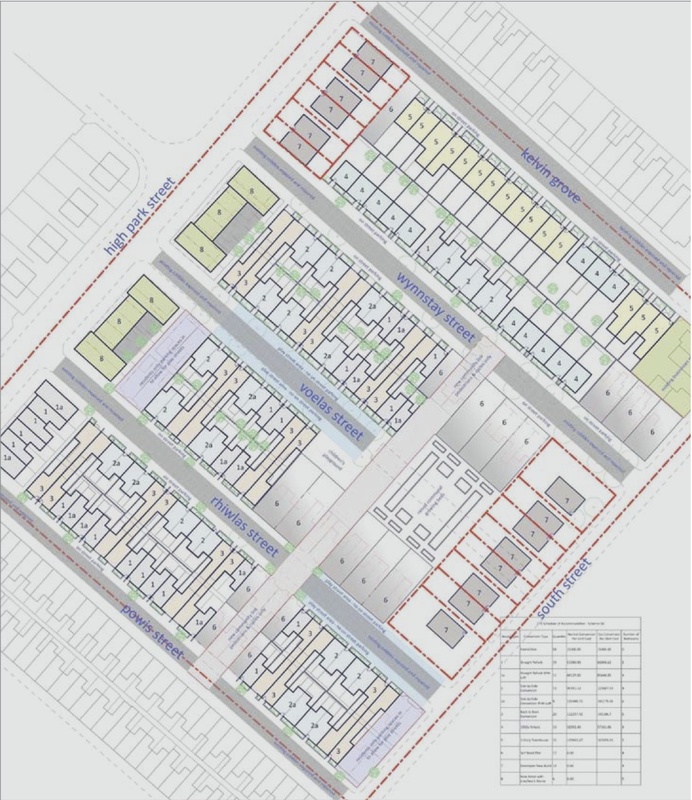 In this scheme we would re orientate the units so they face in towards the rest of the site, creating a couple of small squares within the site itself. • 1950s house (3 bedroom). These were built in small terraces with fairly generous front and rear gardens. They are well laid out but in need of modernisation, they have been considered dated by many and are usually the first target for the wrecking ball, however a number of them are still occupied, with the residents of these properties feeling particularly vulnerable. 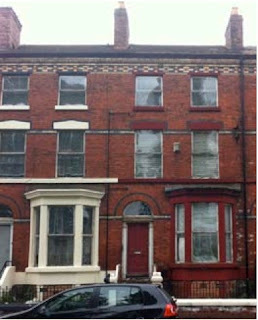 • Victorian terrace properties (3 story with basements). 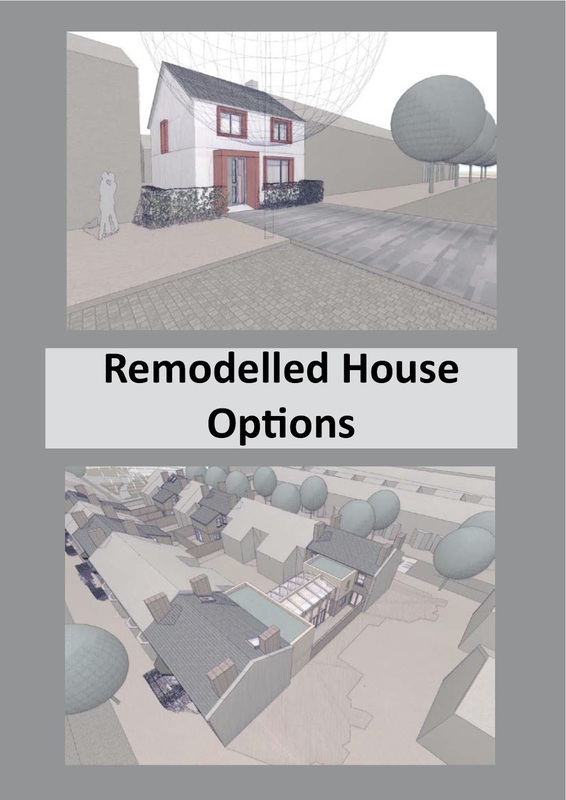 These properties would be highly desirable like those on Greenheys Road across the avenue, had they not been blighted, allowed to fall into disrepair, and adjacent to a site earmarked for demolition. 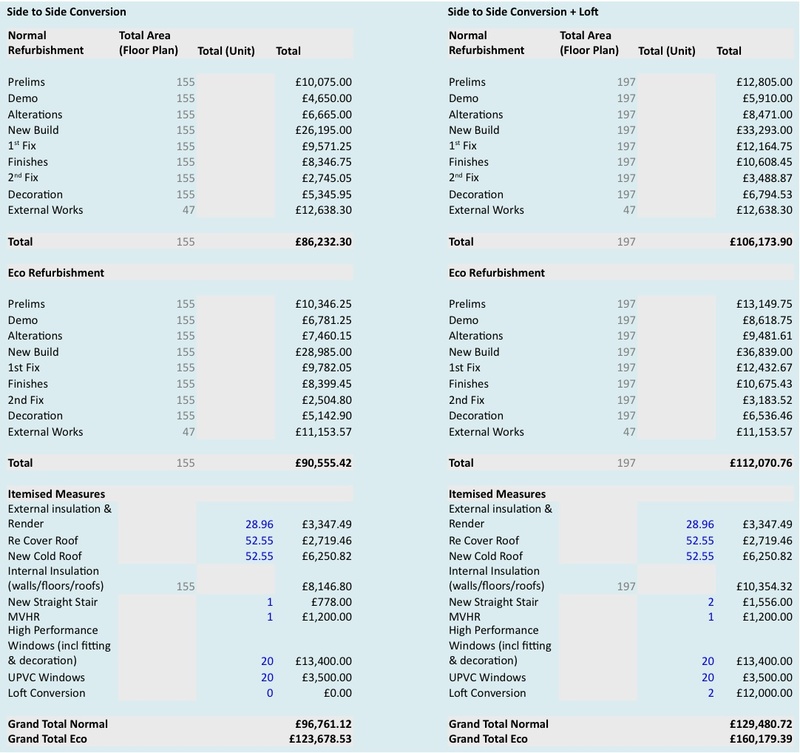 The only challenge in recovering them for use appears to be their size vs the cost of refurbishment and the margins apparently not being as favourable as new build. 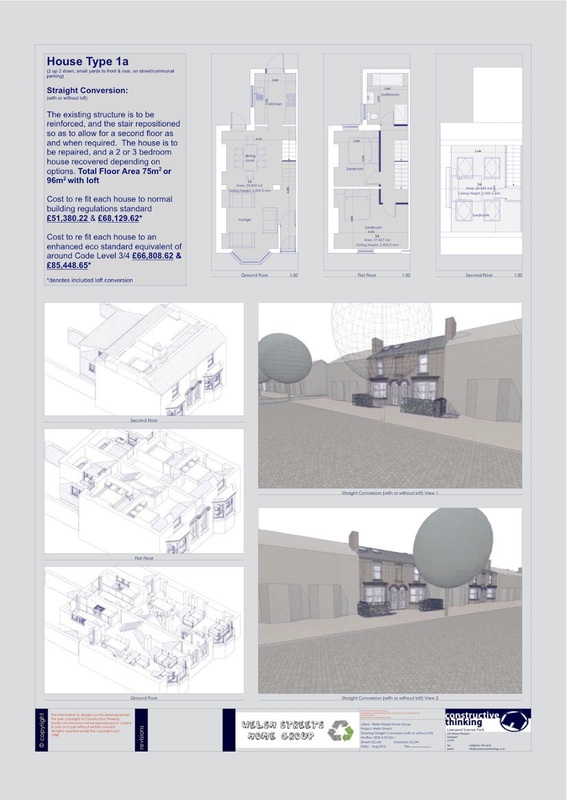 These are almost identical to the two houses we have recently renovated on Botanic Rd..
From these house types we designed a number of remodelling options which will be explained in greater detail on the following pages. 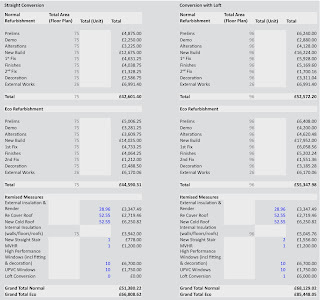 Each house type was then costed using financial models derived from our recent projects on Botanic Rd. 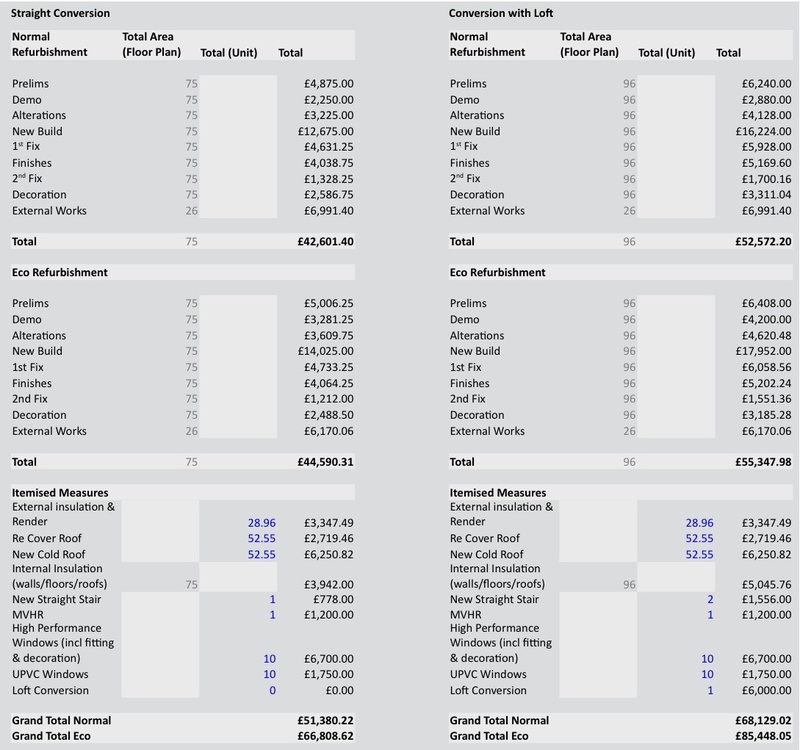 This gave us a realistic budget for upgrading works to both current UK building regulations standard, as well as an enhanced specification which would allow the conversion of the properties to a standard equivalent to Code for Sustainable Homes Level 3/4+. Looking first of all at the normal 2 up 2 down property in isolation, the first thing we considered was the potential market. So who lives in a house like this? Clearly they are too small for families, yet apartments both inside and outside the City centre with not only less amenity space, but less floor area are incredibly popular within the housing market. City centre flats have no parking, no gardens, and a door straight on to the street. So where is the problem here? Additionally apartments are usually impossible to reconfigure or extend, so we were looking to create a property type which could not only offer more than the average flat in terms of floor area, but also the flexibility to alter them should the needs of the residents change. The main challenge with these properties is the position of the staircase, any potential for converting the loft space into an additional bedroom was impossible. However if the ground floor was treated as one open plan living space, and the staircase moved round, the potential to do this was restored. Our proposal then allowed for this to take place no only during the reconfiguration works but also to allow for it to take place in the future were it not required at the outset. House type 1 therefore proposes that the ground floor be opened up, the staircase be repositioned and the fabric of the building be stabilised and the loft left ready for conversion should it be required. 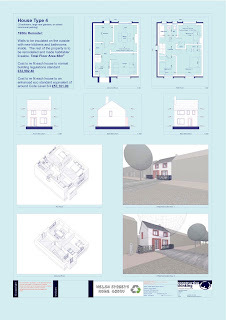 The variation House type 1a has the loft conversion done from the outset to provide a contemporary 3 bedroom home. 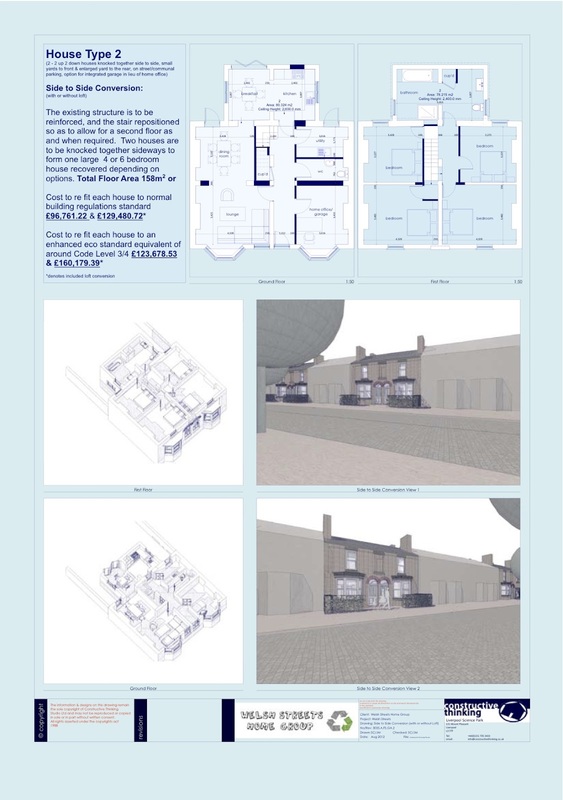 This proposal looked at knocking two properties together side to side, again the first thing we considered was the potential market. This time with the 4-6 bedroom conversion, we would be looking at families, so the addition of a utility room and wc at ground floor level was necessary given the additional people the property now had to accommodate. We also allowed for a study at ground floor level as illustrated, but also have the option to take down one of the bay windows to provide a garage if required, which would allow for secure off street parking within the curtilage. The rear yard, although still small is double the size of the original properties, and with the additional shared amenity space, and possibility of play streets, we feel the property should more than cater for the needs of the average family. Again as with the previous proposal the position of the staircase has been altered to allow for a possible loft conversion to provide a 6 bedroom property should the space be required. 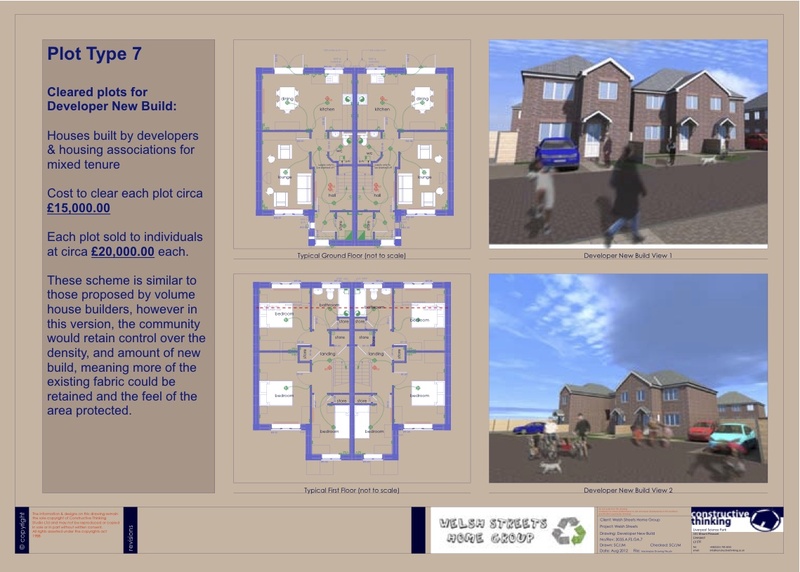 The second expansion scheme we looked at was to knock two properties together, back to back. The first advantage of this proposal is that with a new 2 story link, both properties can be served by a single staircase that gives greater freedom in terms of layout. The second thing it allows is for a first floor extension to the rear of one of the units as the overlooking issues normally associated with this type of extension are overcome, as the new windows are looking back at the same property. 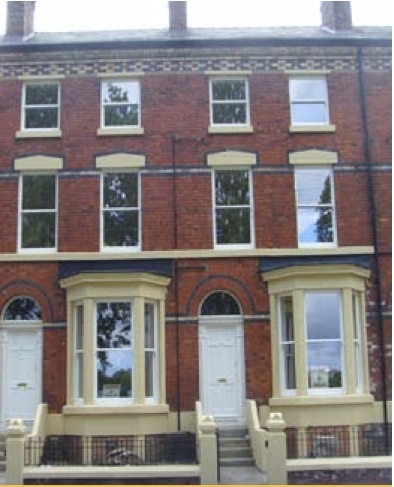 Again with this 4 bedroom conversion, we would be looking mainly housing at families, so the addition of a utility room at ground floor level, and an additional shower room at first floor was necessary given the additional people the property now had to accommodate. 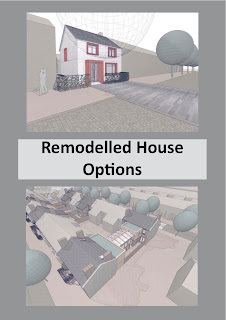 We allowed for an option with a home office/studio or garage depending on the needs of the residents, which would allow for secure off street parking within the curtilage. The rear yard on this scheme may seem rather long and narrow, but the intention is that the ground floor link, shown on this drawing as a dining area, should be able to open up entirely onto the outside courtyard with level access to make the space not only larger, but more useable in inclement weather. We have also been able to provide an additional sitting room which we envisage might be attractive for families with older children who may wish to have their own space to relax/watch tv/play video games etc. Although dated, these houses are generally well laid out and structurally sound. The layouts seem to work pretty well in terms of the demands of modern living, which should be expected given their relative age. The scale of them seems to be relatively appropriate to the context, and the larger plot size offers an important variety within the site which it would seem a shame to lose. They do however, like much of the site, suffer from poor thermal performance, and although of their time, the external appearance of the properties offers little to enhance the street scene, unlike the Victorian terraces. We would therefore propose externally insulating and rendering the properties with new window, doors and reveals to update the external appearance and thermal performance at the same time. Additionally we would look to re cover the roofs using natural slate to help give some kind of unity along the street, but the feeling they should look distinct from the Victorian houses needs to be maintained. They would also need new electrical and heating systems to replace those removed by vandals where properties are empty, as well as to be completely redecorated, and fitted with new kitchens & bathrooms, and the gardens would need some tidying up, but these are probably the least challenging to bring back into use. This is possibly the simplest conversion from the point of view of the original layout, however we do understand that some of the properties may have been converted into flats over the years and as such will need to be either converted back to houses or reconfigured/redecorated as flats again. A minor amount of alteration works is envisaged for the property we looked at to give an enlarged kitchen breakfast at ground floor level, and to properly convert the cellar. We have also added an additional bathroom at second floor level. 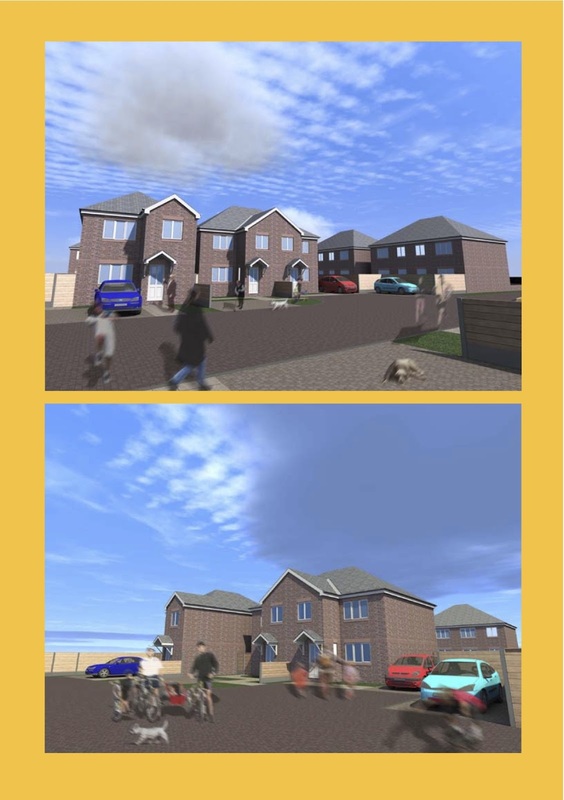 These properties would be ideal for large families, potentially many generations of the same family could quite easily be accommodated, and we are given to understand that there is a shortage of this type of accommodation within the city at the moment. What we would say is that the stock within the city to offer this type of accommodation is there, it just needs to be appropriately converted. The council is already backing the government drive to encourage self build within the city. 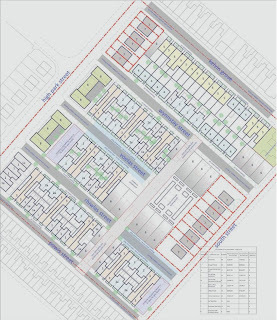 The proposal to include varying amounts within this site makes sense for many reasons, but to have them mixed in with the housing on offer on our various proposals would be a great opportunity to inject some more architectural variaty to the community. Several private developers have shown interest in supporting the proposals. Whilst a single developer proposal carries inherent risk, a diversely financed and mixed tenure approach offers resilience and longevity to a re-emerging community. The key to this approach is to increase the cross-section of stake-holders. Given a notional mix of 33% owner- occupier, 33% Developer-led rental and sales and 34% Social Landlord, it can be shown that a diverse and cross-stratified community may be encouraged. Indeed, national planning policy encourages developments of mixed tenure and affordability in new developments. In this area, the framework of a community already exists. 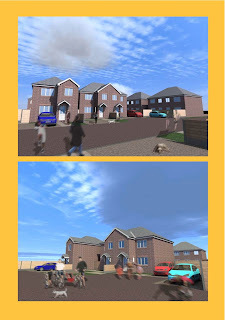 It then follows that an approach through which individual renovators, self-builders, private tenants, social tenants and home owners all invest together is best likely to ensure a highly active, vibrant and long- lasting community, befitting of its urban setting and proximity to the centre of Liverpool.